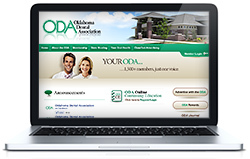 TEMECULA, CA—October 3, 2008—Today, the Oklahoma Dental Association (ODA) launched their new and improved website (www.okda.org) with a more contemporary look and advanced backend features that simplify maintenance for ODA staff. The new website was designed by ProSites, the nation's leading provider of website design and Internet marketing services for medical and dental professionals. Powered by ProSites' WebEngine technology, the new website enables ODA staff to make changes to the site using a simple "point & click" interface called the Website Editor. "Our previous website was designed in a very outdated and hard-to-manage program, as are most websites," says Lynn Means, Assistant Executive Director of ODA. "Now we have the ability to login 24/7 and make changes to our website. The ProSites Website Editor makes it so easy to edit our site, add new pages and upload photos," said Means. "ProSites has created a simple user interface that makes everyone an instant webmaster," says ProSites CEO, Lance McCollough. "Static websites are a thing of the past. Database-driven websites like ProSites gives users more control over their website. Our WebEngine technology allows us to offer more features and greater benefits to our customers," said McCollough. ProSites designs custom and semi-custom websites for medical and dental professionals. Each website is powered by the company's WebEngine technology, which allows for unlimited changes, unlimited pages, and free lifetime upgrades for customers. In addition to custom website design, ProSites also offers a library of dozens of pre-designed site styles that customers can choose from. Users also have the unique ability to pick a new website style as often as they wish, which is another significant advantage over most static website being produced today by other design firms. After thoroughly reviewing the merits of several website design and Internet marketing companies, the ODA selected ProSites as the endorsed website provider for their members. "We are so impressed by ProSites and their technology that we wanted to both endorse them and asked them to re-design our own corporate website," said Lynn Means. Founded in 1907, the Oklahoma Dental Association has a proud membership of over 1,500 dentist members and is headquartered in Oklahoma City. The Association was established to help foster an awareness of the obligations and responsibilities of the dental profession to society, to help advance the art and science of dentistry, and to promote public health and health services in the State of Oklahoma. For more information, visit www.okda.org or call (800) 876-8890.